The ships in Carnival Cruise Line's Dream Class -- Carnival Breeze, Carnival Magic and, of course, Carnival Dream -- are among the line's biggest, newest and most innovative. The similarities are many, so it's no wonder would-be Dream-class cruisers are sometimes left scratching their heads about what sets these ships apart and which vessel is right for them. 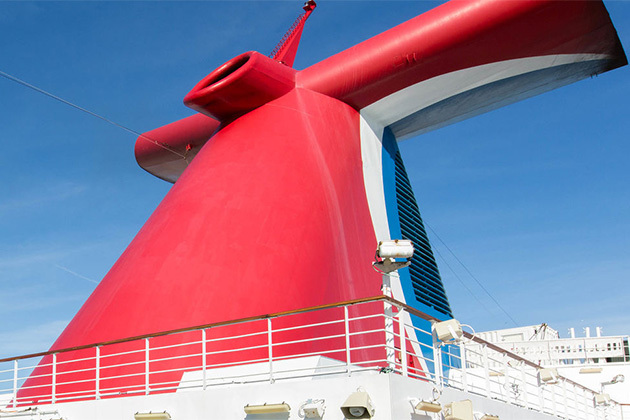 Check out our comparison below to see the similarities and differences between Carnival Dream vs. Magic vs. Breeze. These 130,000-ton mega-ships each have 14 decks and share a similar blueprint, but while Breeze and Magic carry 3,690 passengers apiece, Dream caries 3,646. Dream was the first to debut, launching in 2009 and creating the footprint for Magic in 2011 and Breeze in 2012. 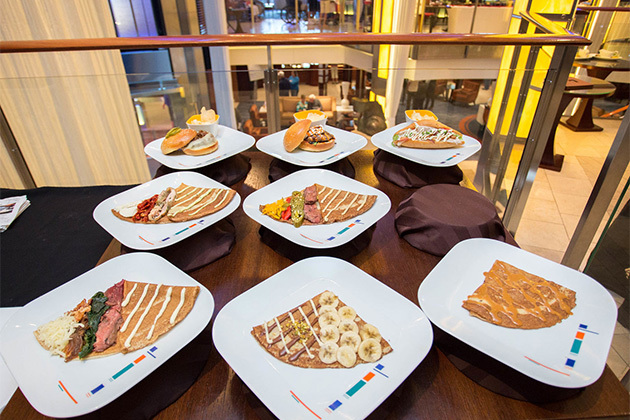 Hungry cruisers will find no shortage of restaurant choices on Dream-class ships. 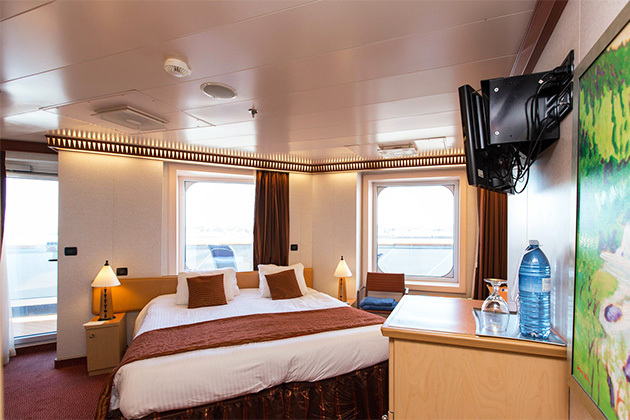 Carnival Magic, Dream and Breeze all feature a main dining room, the Lido Buffet, Guy's Pig & Anchor Bar-B-Que, a steakhouse, Mongolian Wok, Tandoor, Chef's Table and 24-hour room service. In late 2010, Carnival launched its Fun Ship 2.0 upgrades, most of which were added to Magic and Breeze as they were built, so popular restaurants like BlueIguana Cantina and Guy's Burger Joint can be found onboard. Although Guy's burgers were added to Dream retroactively, the cantina is still absent. However, passengers can still find burritos galore. All three ships also offer hot dogs, pizza and pasta, but the restaurants' names vary from ship to ship. 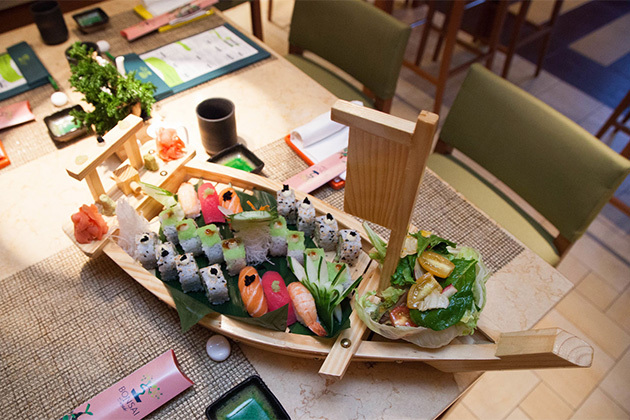 Note that Carnival Breeze is the only ship to have a sushi eatery. Below are the venues that differ, along with a list of the ship(s) on which you'll find them. In total, Magic and Breeze each have eight onboard bars, while Dream has seven. All three ships offer the RedFrog Rum Bar and BlueIguana Tequila Bar, both part of Carnival's fleetwide Fun Ship 2.0 upgrades. Each ship is also home to standard bars that include those found by the pool and in the casino. Below are three bars that vary from ship to ship. Alchemy Bar: This bar, on Carnival Magic, offers alcoholic concoctions for whatever ails you. Choose from a menu, or write your order on a "prescription" pad, and hand it to your bartender, who will likely be clad in a white lab coat. Sports Bar: Oddly, Carnival Dream is the only ship of these three that has a sports bar where passengers can grab a pint to sip while watching live sports on one of several screens. 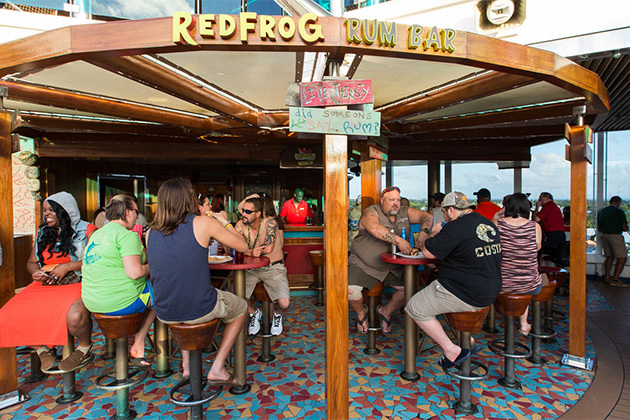 RedFrog Pub: Not to be confused with the poolside RedFrog Rum Bar, which has a more tropical vibe, this pub offers Carnival's own microbrew -- ThirstyFrog Red -- and is found on Carnival Breeze and Carnival Magic. Differences lie mainly in the color of the decor, with Dream and Magic following a burnt-orange, rust and cream color scheme. Meanwhile, Carnival Breeze's palette is a lovely combination of white and brown with blue accents. Dream also carries 44 fewer passengers, meaning Breeze and Magic have roughly 20 more cabins each than Dream does. When it comes to onboard entertainment and activities, each ship in this trio features production shows in a main theater, a piano bar, the Punchliner Comedy Club, live DJs trained by DJ Irie (official DJ of the Miami Heat basketball team), karaoke and a nightclub. Below is a breakdown of venues that vary across these vessels. Playlist Productions: This set of production shows, offering high-tech special effects, LED screens and exceptional costumes -- a welcome change from tired song-and-dance revues offered by some other cruise lines -- can be found on Carnival Breeze. Carnival Live:Featuring extra-fee performances by high-profile comedians and recording artists, Carnival Live brings talent aboard select sailings of Carnival Breeze and Carnival Dream for shows in the ship's theaters. Hasbro, the Game Show:This interactive, family-friendly game show brings popular board games to life on stage. You'll find it aboard Carnival Breeze. Thrill Theater: Experience the sights, sounds, sensations and smells of various movies in the Thrill Theater on Carnival Breeze. 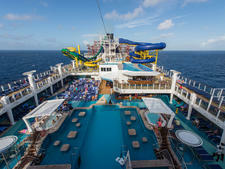 If you're hoping to spend most of your time on the outer decks, you might be interested to know that Breeze, Dream and Magic all provide Dive-In Movies at the Seaside Theater (a giant poolside movie screen), as well as pools, mini-golf, adults-only sun decks, water slides and the WaterWorks splash playground. 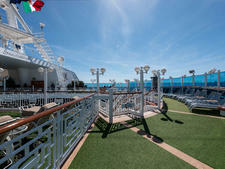 Here are some other fun alfresco attractions, found only on certain ships. SportSquare:This outdoor recreation area, complete with a jogging track, pool tables, Ping-Pong, mini-golf and other sports like basketball, soccer and volleyball, is available on Breeze and Magic. 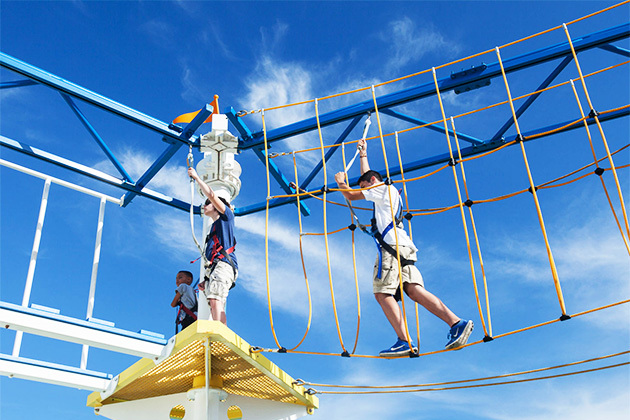 SkyCourse:This aerial ropes course, located in SportSquare, can be found on Magic and Breeze. All three ships offer Camp Ocean facilities and programming for children in age groups 2 to 5, 6 to 8 and 9 to 11, as well as Circle C (ages 12 to 14) and Club O2 (ages 15 to 17). Kids will find video games, theme nights, and arts and crafts, as well as group dinners. Seuss at Sea incorporates Dr. Seuss-themed parades, storytelling events and even a Green Eggs and Ham breakfast (for an extra fee) across all three ships. All offer the Beary Cuddly Workshop -- think Build-A-Bear -- where kids can make their own stuffed animals. Here are two things that differ between the vessels. 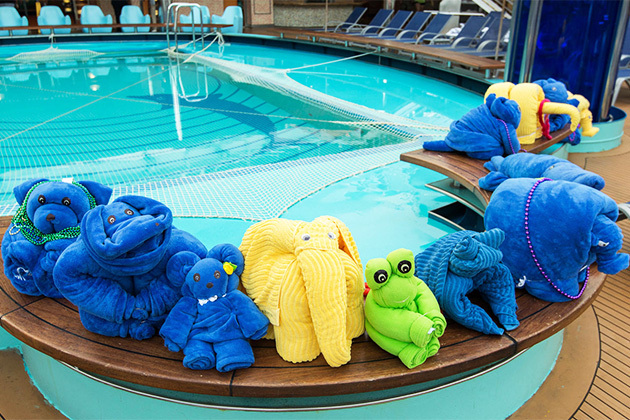 Towel Animal Theater:Towel animal puppets put on a special show for kids. Families can also come early to learn the art of towel folding. 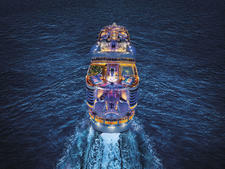 The show is found on Carnival Breeze and Dream. Science & Discovery: In this collection of science-based activities, kids can make volcanoes, learn about sea animals and study topics like buoyancy and ecology. You'll find the programming aboard Carnival Magic and Breeze. 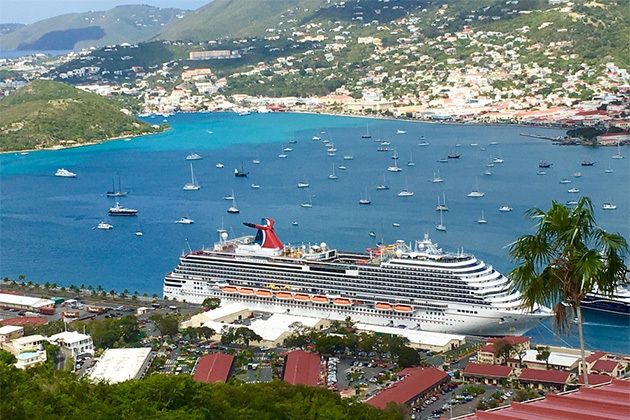 All three cruise ships sail Caribbean-focused itineraries of two to nine nights from homeports in the southern U.S. Prices vary by ship, itinerary and length of sailing. 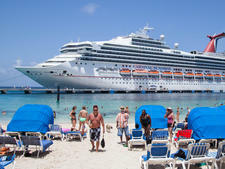 Fares do seem to go down as the ships get older; Carnival Dream sailings are generally a couple hundred dollars less expensive than Carnival Magic sailings, which are a couple hundred less expensive than Carnival Breeze voyages.